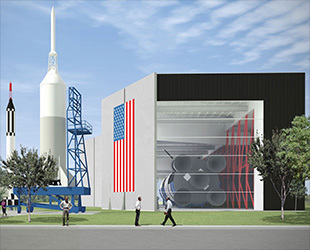 — An architect with a self-professed interest in spaceflight has drafted a design to relaunch the display of a Saturn V moon rocket in Texas. 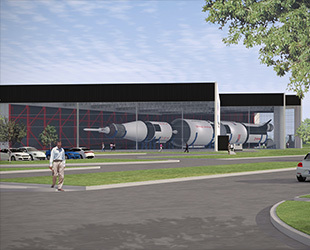 Brantley Hightower of San Antonio's HiWorks Architecture devised his concept for a new glass-fronted building after visiting the Apollo-era booster's current exhibit at NASA's Johnson Space Center in Houston. 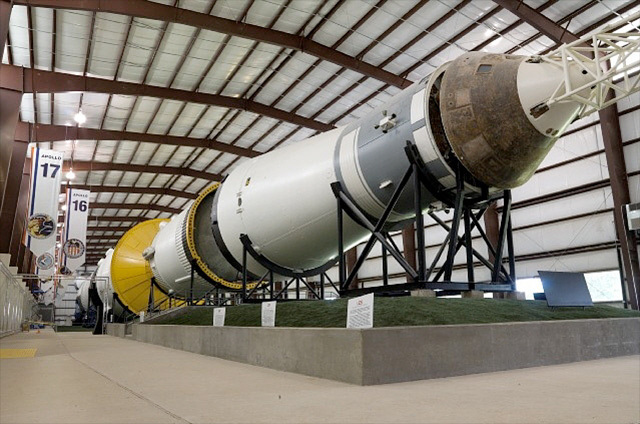 Since 2005, the 363-foot-long (110 meter) Saturn V has been displayed inside a "temporary" structure that was raised as part of a three-year restoration effort. "You have no idea that the pinnacle of twentieth-century engineering is sitting inside that metal building," Hightower said in a release accompanying his design. "It's like they entombed [the rocket] and in doing so took away so much of the power it has to inspire." Between 1967 and 1973, NASA launched thirteen Saturn V rockets. Nine boosters flew astronauts to the moon. The last Saturn V to leave Earth lofted the United States' first space station, Skylab. Prior to its restoration, Houston's Saturn V sat on outside display for decades. Exposed to the elements, the rocket — one of only three remaining and the only display to be composed entirely of parts intended for flight — degraded to the point of being structurally unsound. 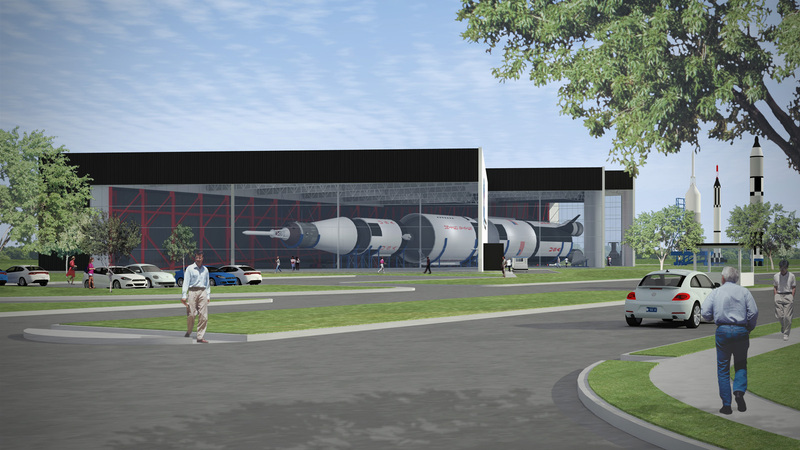 Its building has a full-size mural of the Saturn V along its back side. "It's not that the building needs to draw attention to itself, but what exists now is not appropriate," Hightower stated. "It's not good architecture." 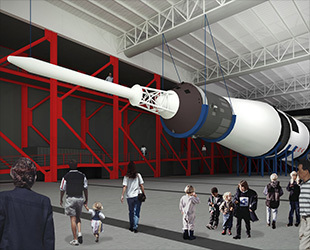 While the rocket is loaned by the Smithsonian, its building and display is the responsibility of the Johnson's exhibits division. 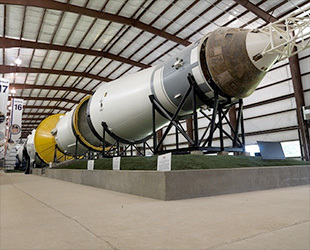 The center's nearby official visitor center, Space Center Houston, offers tours that visit the building, though the Saturn V and its adjacent rocket park, is open to direct access by the public. 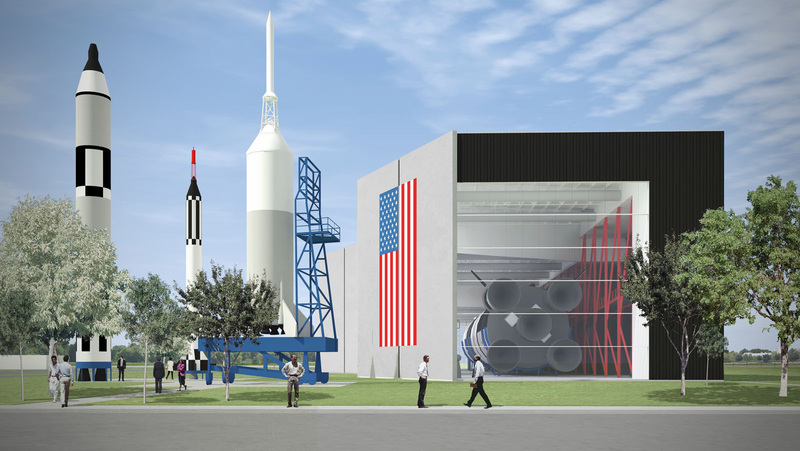 After viewing the moon rocket with his children, Hightower started sketching and eventually developed a concept he thought to be a "more fitting container" for the Saturn V.
The geometry of Hightower's proposed building allows the Saturn V rocket to be seen in its entirety from outside the main entrance to Johnson Space Center, as it was before it was enclosed. Internally, the building's volume provides visitors with the distance to experience the scale of the massive vehicle, while also providing space for exhibits, lectures and other special events. A series of elevated catwalks designed to resemble the rocket's launch pad gantry allow the vehicle to be viewed from above. The building was designed to reflect the mid-century aesthetic that Hightower described as defining the rest of the Johnson Space Center campus. 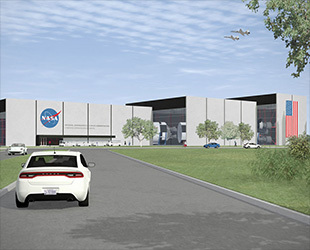 The current building, which NASA has described as being "temporary" but which was designed to stand for at least 10 years, was primarily constrained by the space agency's budget. "There is a perfectly legitimate economic reason why the Saturn V is housed in the building that it currently is," said Hightower in an interview with collectSPACE. "NASA is in the business of running a space program and we'd much rather them concentrate on that than dedicate a portion of their already painfully limited resources to nicer buildings. However, as an architect it pains us to see a design that doesn't live up to its potential." The other two remaining Saturn V rockets on display, one at the Kennedy Space Center in Florida and the other at the U.S. Space and Rocket Center in Alabama, are inside glass-enclosed museums. Both buildings cost upwards of $20 million, underwritten through non-public funds. "Although any building of this scale would be expensive, the proposed design makes use of the same low-cost tilt-up construction used in most big-box retail establishments like Home Depot or Wal-Mart," Hightower explained in an e-mail to collectSPACE. "Our expertise in cost estimating is limited, but assuming a similar cost per square foot, the proposed design would fall somewhere within the $6 to $8 million range." 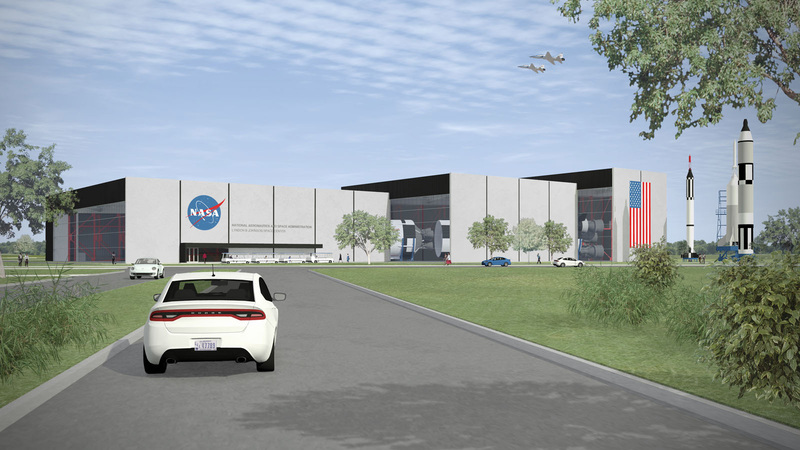 NASA has not solicited for a new building, and Hightower has not been in touch with either the space agency or the Smithsonian. He described his design as a "hypothetical project," although he has been pleased with the reaction it has elicited from the public. "Not that this particular design is ever going to become real," he remarked, "but the legacy of the space program should be celebrated. 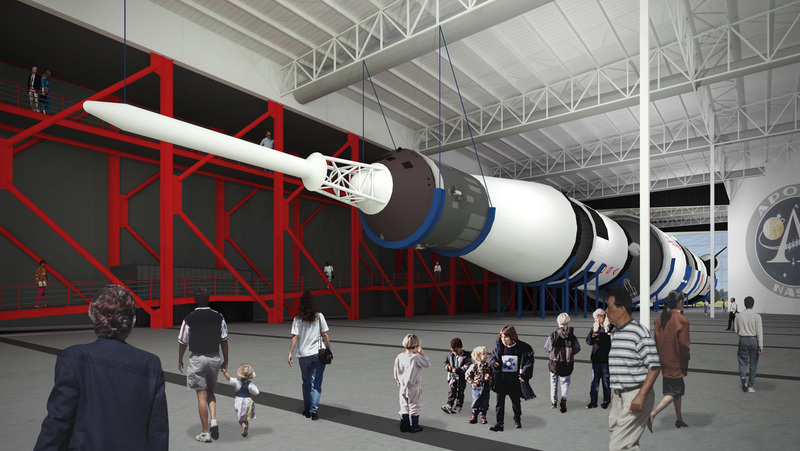 Houston's Saturn V deserves more." This isn't Hightower's first space-related project. His firm previously placed second in a contest to propose reuses for Houston's retired Astrodome by suggesting the former sports stadium serve as a floating sanctuary for the city's cultural and artistic treasures. HiWorks also designed the mission patch for World View Enterprise's suborbital flights on a balloon-lofted capsule.